Posted under Health Guides. Updated 13 April 2017. TMJ disorders cause pain in the jaw joint area, headaches, neck and shoulder pain. TMJ is usually temporary and improves with comfort measures. If you have symptoms of TMJ, talk to your dentist or health care provider. TMJ is short for temporomandibular (tem-pour-o-man-dib-u-lar) joint (disorders/conditions). The TMJ connects the “mandible” (the lower jaw) to the temporol bone (located on either side of your face near your ears). People who have a TMJ disorder typically have pain and problems with the jaw joint, in the muscles that allow the jaw to move, headaches, neck and shoulder pain, and sometimes sensitivity in their teeth as well. What are the different types of TMJ disorders? Medical experts feel that the pain with TMJ conditions fall into 1 of 3 categories. Pain that effects the muscles that regulate movement of the jaw. The medical term for this type of discomfort is called “myofascial” pain. Pain that is due to an injury or accident that may have dislocated or moved the jaw or a disc in the upper spine. Pain that is caused from arthritis or another type of condition that causes inflammation of the TMJ. TMJ can be caused from trauma to the jaw or upper neck but for the most part, the exact cause is unknown. Very often, TMJ related pain starts with bruxism (clenching or grinding of the teeth) and sometimes without any warning at all. Females are more likely to have symptoms than males. Some people have a clicking noise or popping noise when they open their mouth widely, but just having a funny sound doesn’t necessarily mean that you have TMJ. People who grind or clench their teeth (even when they are sleeping) are at risk for having a TMJ disorder. Stress can also play a role in making a person more likely to experience TMJ symptoms. The most common complaint is pain in the jaw/joint area and muscles that allow you to chew. Pain can also extend to your face, head and/or neck and in some cases, your ears. Uncomfortable “clicking” or “popping” in the joint area when opening and closing your mouth. If you have any of the symptoms, talk to your dentist or primary care provider. Your dentist or health care provider will listen to your symptoms and figure out if you could have TMJ or if your symptoms are caused from another medical condition such as an ear infection or tooth-related problem. In some cases, your provider may order an x-ray or another imaging test to rule out other possible causes of your symptoms. 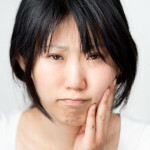 What are the treatments for TMJ? Jaw/joint pain often comes and goes, so comfort measures during a time when you are experiencing symptoms can really help. Avoid chewing gum, eating big sandwiches or other movements such as yawning widely or singing with your mouth wide open. Apply moist heat to the sides of your face near your ears. This will help relax your muscles. This is especially helpful before bedtime if you feel you may be grinding your teeth while you sleep. Eat soft foods such as pasta or eggs, instead of chewy foods. Your health care provider may suggest that you take an over-the-counter anti-inflammatory medicine such as “ibuprofen” for temporary relief of pain. A special medication called a “muscle relaxant” may be prescribed for severe TMJ pain. Additionally, your dentist may recommend wearing an oral appliance such as a mouth guard at night. Most of the time, TMJ gets better. Surgery is rarely needed, unless the pain continues for a long period of time and doesn’t get better with comfort measures. Although not everyone who grinds their teeth experiences stress, you can work on ways to relax and become aware of when you clench or grind your teeth, so you can try to stop.